When the field winding is supplied from external, separate d.c. supply i.e. 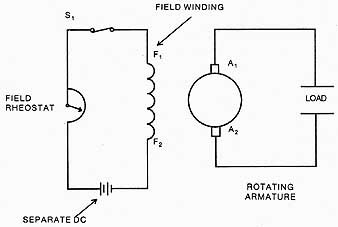 excitation of field winding is separate then the generator is called separately excited generator. Schematic representation of this type is shown in the Fig.1. The field winding of this type of generator has large number of turns of thin wire. So length of such winding is more with less cross-sectional area. So resistance of this field winding is high in order to limit the field current. The field winding is excited separately, so the field current depends on supply voltage and resistance of the field winding. For armature side, we can see that it is supplying a load, demanding a load current of IL at a voltage of Vt which is called terminal voltage. Generally Vbrush is neglected as is negligible compared to other voltages.